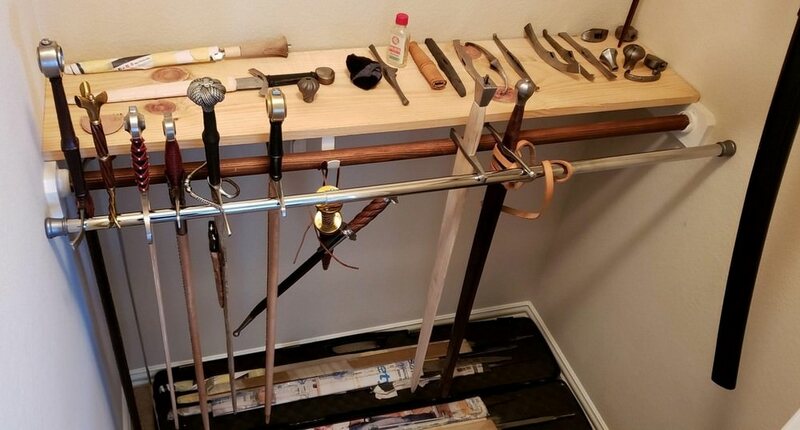 My personal opinion is that if you want to both display and secure your sharp pointy things, you need a dedicated room, with a good door on it (and good walls). This will probably cost more than the swords within. Unfortunately, any display cabinet which will be relatively burglar proof, will be rather pricey. Honestly, to ensure your swords aren't stolen, burnt or destroyed in an earthquake, I'd recommend not owning swords. If it's more a matter of keeping children and overly touchy adults away from them, a simple lockable glass or perspex cabinet should do. My solution for dangerous objects is a big safe, but it's not a great display piece. I hope I haven't gotten you in trouble with this post. 'fraid I have to agree with Darren. Even the most sophisticated security measures will not fox the dedicated burglar if they are intent upon stealing your prised swords. The only things I can suggest is to play it safe and use common sense - don't display your swords next to a window through which they can be seen. Close curtains at night when you put the internal room lights on. Don't wave your swords round in your front garden for all the neighbourhood to see. Opportunistic burglars are more likely to nick your DVDs and TV / electrical equipment than your swords, and dedicated sword thieves are - as Darren and I said above - unlikely to be deterred by security measures. Swords and the family are a difficult one. Children just love shiney things, don't they? They just have to 'check' how sharp something is by running their finger down the blade... and just how cool will their mates think they are when they whip out their dad's sword to show it off? - or that's how I see their mind working!! I can only think of some kind of large D-locking padlock attached to a chain on the wall - but how UGLY would that look? A perspex cabinet sounds the best bet, with a strong cabinet lock on it. I hope you find your solution! So took 20$ and 5 min to replace the closet handle with one that locks with a key. Found a shower curtain rod (adjustable fit) left behind by the previous owners and set it parallel to the clothes handing rod and voila. I can reproduce the set up on the side where there are additional hanging rods too. Swords are hanging point downwards, a very convenient set up. I'm not one to hang swords on the wall, ready to be grabbed by however walks by. Nothing groundbreaking, but this set up checks all boxes from the safety standpoint (more related to kids than burglars - though my stuff is now much harder to get to for the casual home intruder). Also got plenty of room to expend on the sides and plenty of room for my board games and computer junk on above shelves. Most importantly, I have all my projects right under my nose - and fiddling around is the key for me to get back to it.